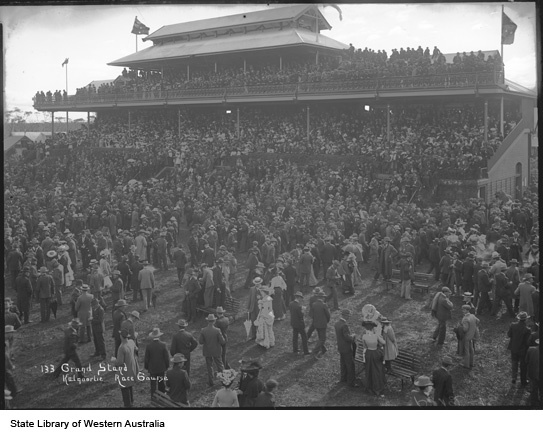 Thousands of fashionably dressed men and women cheered as they battled down the straight for the finish at Kalgoorlie. Yet only a few days later, the winning horse had his head smashed in and his carcase set alight near Gingin. A hoof from the poor animal was hung in the criminal museum at Perth Police Station for many years. It should be clear 1918 was an unusual year for racing in Western Australia. The hoof was from Aversion, a horse at the centre of one of the most remarkable stories in the history of the Australian turf. Now forgotten, Aversion was a first-class performer on the metropolitan courses. He won several big races and was at the top of his form when he was disqualified for a year. As far as the public knew, Aversion had been sent to a paddock for semi-retirement. The 1918 Goldfields racing season was massive. Perth horses were drifting into town to prepare for the big races. Shortly before the event, an unknown horse named Loch Var was nominated for a third-class handicap. The paperwork submitted with his application showed he was a mediocre performer, and the handicapper treated him leniently. On the day of the race, it was pouring. Loch Var was brought into the saddling paddock. Although heavily rugged, several commentators noted he looked strong and might do well for himself in the future. Strange news started filtering through the course. Loch Var, an unknown newcomer, was being backed off the boards. The cash was pouring in, and no matter how the bookmakers lowered the odds, there were still takers. Any price was good enough. Then they were off! Straight to the lead went Loch Var, and it was no race. In the pouring rain he opened a bigger and bigger gap. But what most people failed to notice in the excitement was the effect of the water on his steaming body. The horse’s white blaze had shifted its position, and a white fetlock was now practically washed off. There was only one subject of conversation that night. There had been a gigantic swindle! Loch Var was the disqualified Aversion, and should have carried at least twenty kilograms more than he did. Loch Var’s owners put him straight on a train back to Perth. They did not wait to collect the stake, and did not need to. They had got all they wanted from the books. But the police were moving. However, moments before they caught up with the criminals, the horse was taken to a paddock at Gingin, his head clubbed and the body set on fire. The gang was prosecuted, and banned from all racecourses for life. What remains of Aversion now? Dodgy Perth would love to know if the hoof still exists in a forgotten box in the police archives. Anyone know?